You are in Japan of the 15th Century, a period marked by unrest and problems. The different areas are controlled by clans. At the beginning of the game you find yourself in the sad life of a Japanese citizen who is affected by hard work. As a tramp you will learn the basics of the game and know you have to try your daily bread. If you strive to and trust your roommate will soon win you get a piece of land and have a livelihood. In the game you meet other people that you are here to assist you, but this you need a certain amount of money. In the administration of the village, which consists of other players, it offers you to work. Have you reached the level 1 you get a farm where you can grow food. The first piece of land you can produce your own food first. What is left is for sale on the market. Over time, your life improves more and more, as well as your reputation and your clothes. New possibilities open up, you can learn to stay a profession, and offer players work in your own field. Gradually you’re running through the various levels, from farmers to scientists and to a feared fighter. In Dojo, you can be claimed by other players to duels. But life in the war time in the vibrated Samurai game can also be hard. The leaders of the different areas to fight for supremacy. Weirs could only well-armed countries. The interaction of the players decide the fate of the country. Strategy RPG require skill and good ideas, lead your country to your destination! To play online games like this you need to ledigdlich an internet connection and a user account, as are role-playing browser games and browser games to its free online games, everything is free of registration to use the game. A download is not necessary, you can play online browser games completely. There is no limit to the number of rounds, the game can be endless. The Samurai is a game that requires relatively little time. In five minutes you can determine the total daily actions of your character. The fantasy medieval browser game develops further and further. Currently it has five levels, but by the requests of the players can be added more levels. 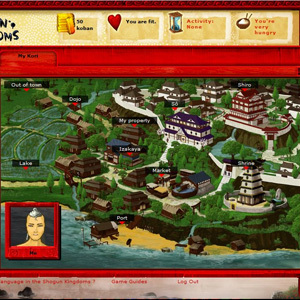 Like most online games has also Shogun Kingdoms a forum where you can interact with other players over the news etc..